We talk about knitting, (pop) culture and ideas. Franklin Habit is well-known in the world of knitting. He writes the Panoptican Blog and is the author It Itches, a stash of knitting cartoons. He is also a photographer and a popular teacher at knitting gatherings. Franklin's classes about photographing your knitwear always sell out in record time. Franklin is an avid researcher of knitting history and his articles that have appeared in, among other places: Knitty, Twist Collective and The Weekly Stitch. In the course of our chat, Franklin mentions the Men's Knitting Retreats and two of its founders, QueerJoe's Knitting Blog, and Knitterguy. Franklin also refers to Elizabeth Zimmermann's Knitting Without Tears. Our conversation was recorded during the very first Vogue Knitting Live! in New York City back in 2011. Enjoy! 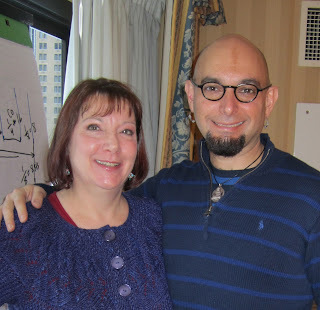 Franklin will be at the 2013 New York City Vogue Knitting Live! Latte: Ben is working on the Java socks, and is almost done! Abby hasn't cast on anything new this week. She did have to restart Ben's Smartphone Mitts because somehow her gauge got off. She is also suffering from a bit of PYD, "Precious Yarn Disorder" that prevented her from starting the Brickletown Mitts from her handspun. She will get out her McMorran balance and see if she has enough San Francisco Nights hand spun to make both socks and mitts. Brewing: We talk about design, of course. Ben offers advice and Abby commits to sketching a sweater design by next week. Abby referred to Cookie A's book Knit Sock Love for an example of the way different design ideas can be shown on a flat "exploded" view of a sock. 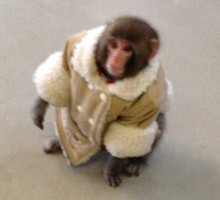 We take a slight detour and mention the now-infamous "Ikea Monkey". Abby also mentioned Jean Frost's method of doing a "practice knit jacket" with sweatshirt fabric. Menu: Abby made Vegetarian Borscht from Barbara Kafka's Soup, a Way of Life. She managed to spread the work out over three days and thus the experience was relatively stress-free. The borscht was fabulous! Sofa: Ben delves further into the music/knitting connection. 103 - Knitting is Yours! David Byrne in Stop Making Sense the "Big Suit"
Latte: Ben is back to knitting the Java socks, and he says that his solution to "second sock syndrome" is to take a long break between knitting the first and second socks. Abby, after much thought, decided to frog back her Bright and Sunny Cardigan to correct the mistake in the raglan increases as well as the "unhappy" skein join. Abby is enamored of the tubular cast on she used on Ben's Smartphone Mitts. She used the technique explained in Lucy Neatby's Cool Socks, Warm Feet. Abby likes wearing fingerless mitts for the Berkeley climate, and she's going to knit the Brickletown Mitts by Elizabeth Doherty. Sofa: Ben is reading David Byrne's How Music Works. We discuss creativity, Talking Heads, Stop Making Sense and the connection between music and fiber! If you don't know Talking Heads, we recommend you start with Fear of Music. 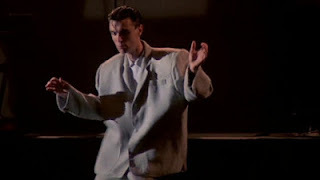 Note: Many scenes from Stop Making Sense are available on YouTube, but we highly recommend watching the entire movie start to finish because it is so beautifully directed. We invite listeners to join us in a to-be-scheduled hangout where we design knitting to represent music. Are you game? And finally, we ask: what makes knitting a fulfilling experience for you? Listeners: How have you found ways to make apparently wasted time and/or energy useful? Bitter Cup: Abby started some socks for Ben a year ago that have been languishing. They are going to be frogged and turned into Smartphone Friendly Mitts by Dieuwke van Mulligan. Abby missed a raglan increase in her Bright and Sunny sweater and rather than fake it, she plans to frog back a very long way to the mistake, correcting a bad skein change in the process. We made a passing reference to Stumbling on Happiness as Abby tries to make the best of everything. Ben and Abby both reiterated their enjoyment of the Pop Culture Happy Hour podcast. Ben also referenced an NPR piece called You Can't Possibly Read It All, So Stop Trying. Brewing: We talk about low-cost and no-budget holiday gift giving. Bite: Ben would like suggestions about what he can knit from lightweight cotton yarn in many colors. Ideas? Chai: Our friend Mary enabled us into Zachary's Pizza, a Berkeley tradition, and very wonderful! Not so wonderful was an influx of ants who tried to get out of the rain by invading Abby's apartment. Mary said that cinnamon is an ant deterrent. Anyone know about this? Stir: Ben needs some hands-on spinning help to get him hooked. Abby finished the San Francisco Nights sock yarn and she is very happy with it! She started another 3 ply sock yarn from the color way Touch Me. Both San Francisco Nights and Touch Me are from Crown Mountain Farms. Abby is also spinning some woolen yarn from Lucy, a Merino-Corriedale fleece on her Matchless, which is newly cleaned and shined with Wood Beams. Sofa: We talk about Buffy the Vampire Slayer and what makes for a classic TV series. Ben says Buffy is the "Great Unifier". Tip Jar. Your Barista Thanks You! Knit Knit Cafe Original Patterns! Our theme music is "Sunshine" by Jeff Wahl from his album "12 String". It can be found at Magnatune. This website and its content is copyright of Abby Cohen ©Abby Cohen 2009. ALL RIGHTS RESERVED. Content Copyright 2011 by Abby Cohen. Simple theme. Theme images by tyndyra. Powered by Blogger.